When we moved into our house here in Philadelphia, we were so captivated by the rural feel and the long dirt roads where you can take long walks next to the wheat fields, that we added a gate to the back garden wall. 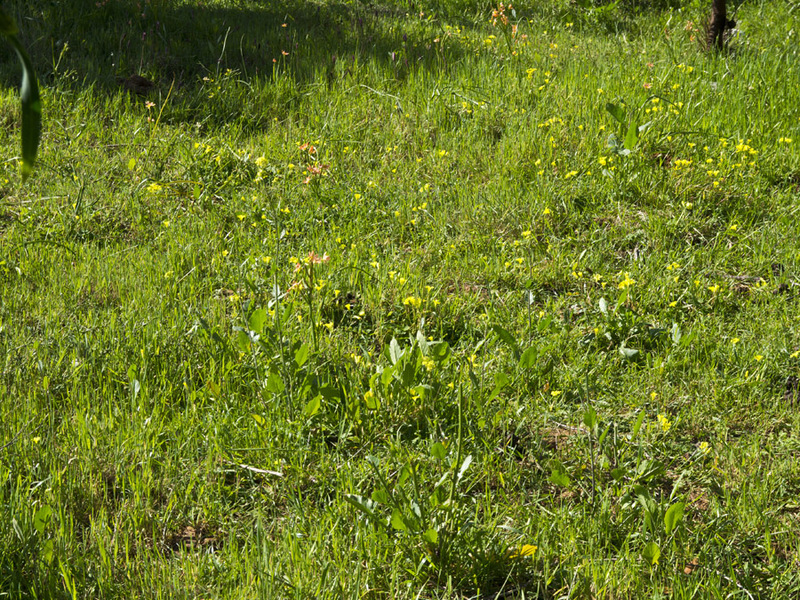 This allowed us easy access to the meadow behind our house and to the long dirt road. 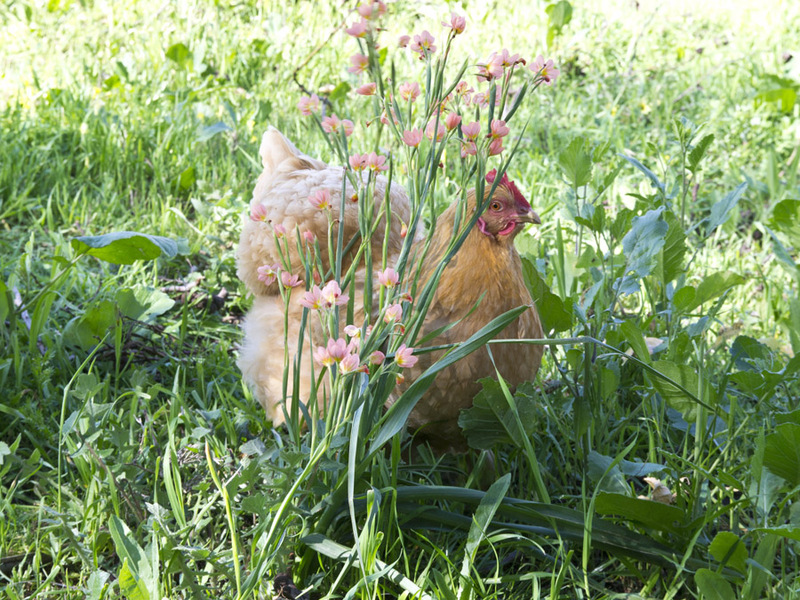 Well, now that we have had to pen our chickens, so that they don’t run rampant around my newly planted garden, I feel so terribly guilty that I open the back gate for them for an hour every day so they can run wild – literally. I do supervise this little extra mural excursion! This has now become our extended back garden. We have made new friends now and they wait for us every day! 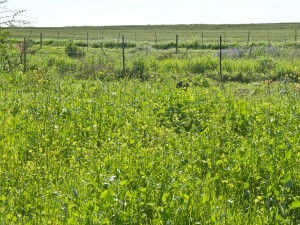 The natural vegetation – lovely! Getting tired of waiting for us! 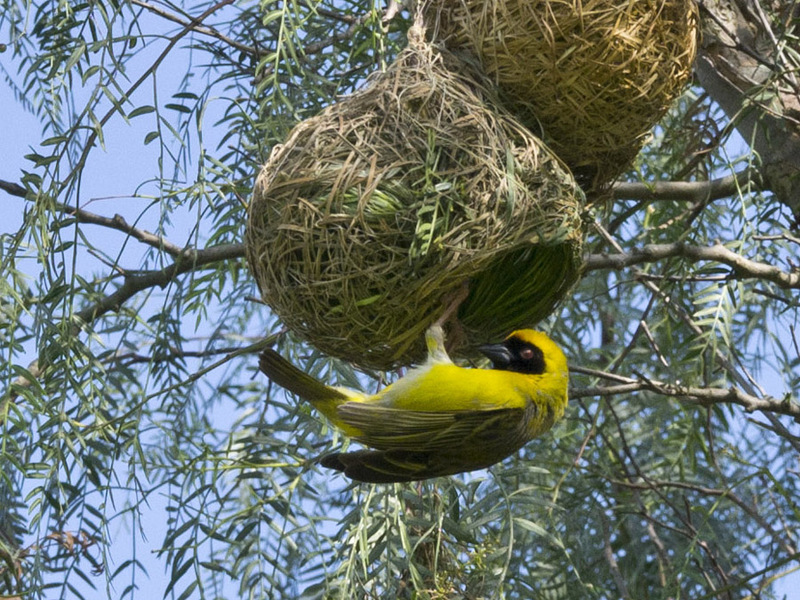 Our favourite friend – the yellow weaver bird! Giving us the eye! Making sure we are looking! 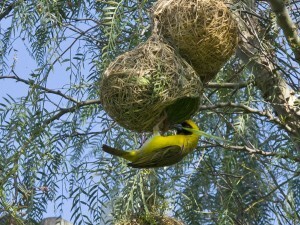 The yellow weaver bird is our favourite little friend who lives in the big Pepper Tree in the meadow behind our house. He is the first one to greet me in the morning when the chickens are let out to play! 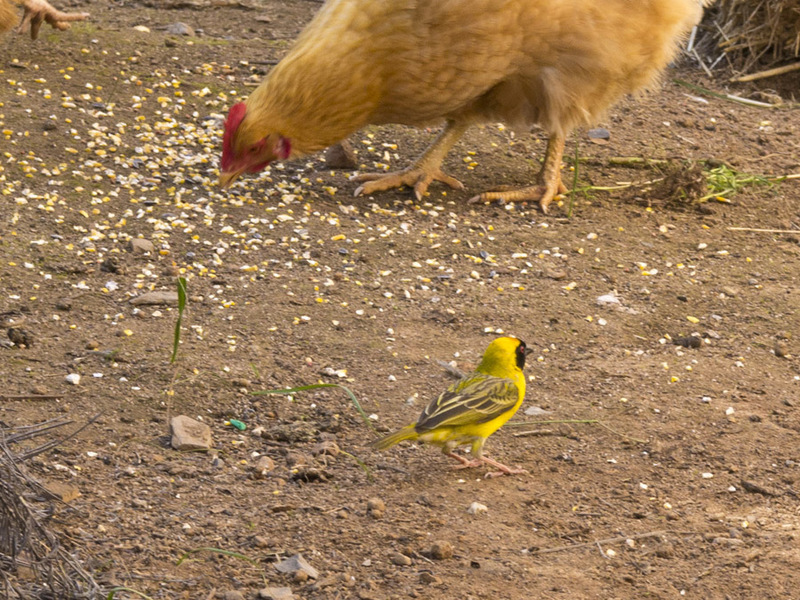 He joins them for morning breakfast! He is so busy with nest building that he has a monsterous appetite. 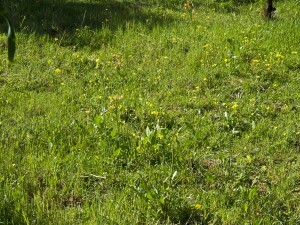 I am so fond of the wild flowers that grow here in the meadow. 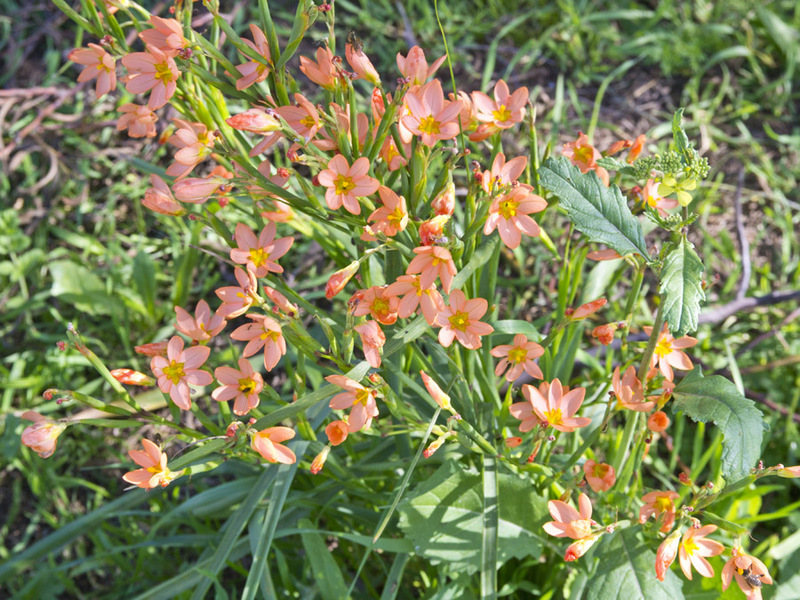 The daisies, the butter cups and the other colourful flowers – I don’t know the name of these. This is such a pretty place. 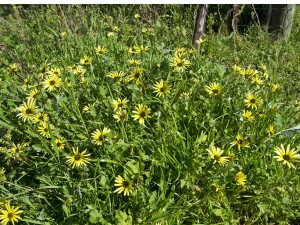 African daisy – I think! 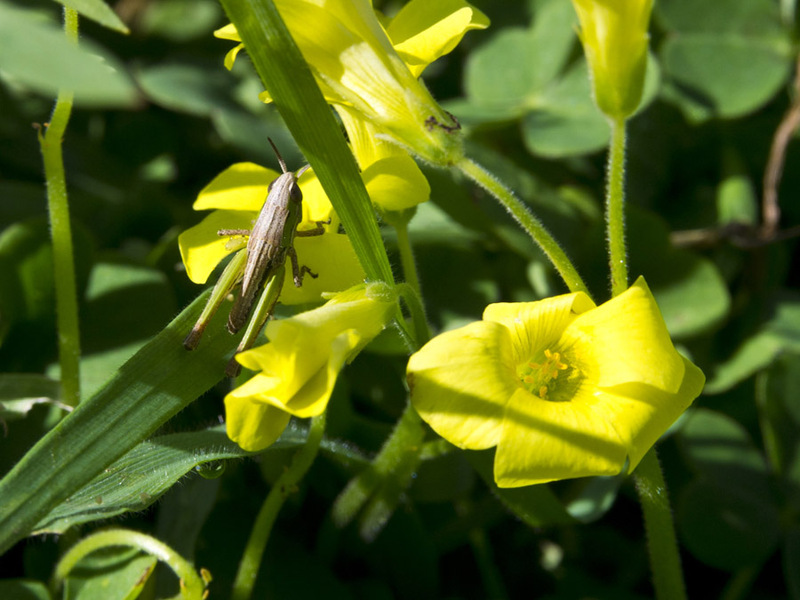 Our small friend the grasshopper greets too! I can see you, Buffy! Thank you for joining us! 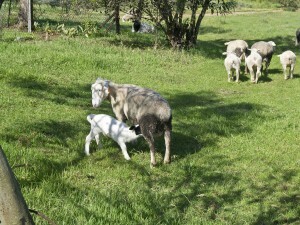 Ok, the sheep have to go now and the weaver bird too, so we are going to go in now too. Time to go home now! 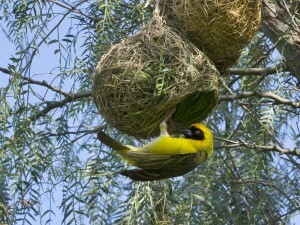 Weaver bird has also had to go home! It is so great to find your garden blog, what beautiful pictures and excellent reminder of how peaceful and friendly the landscape is. Thanks. 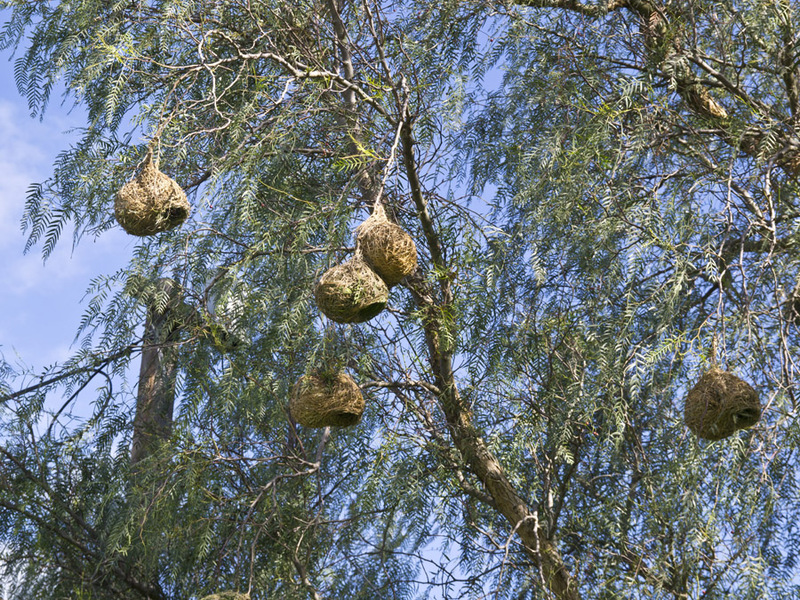 Those weaver bird’s nests are like xmas balls hanging in a huge xmas tree. Love those wild flowers, too! Masked weaver, Oxalis pes-caprae, and Malmesbury gousblom? 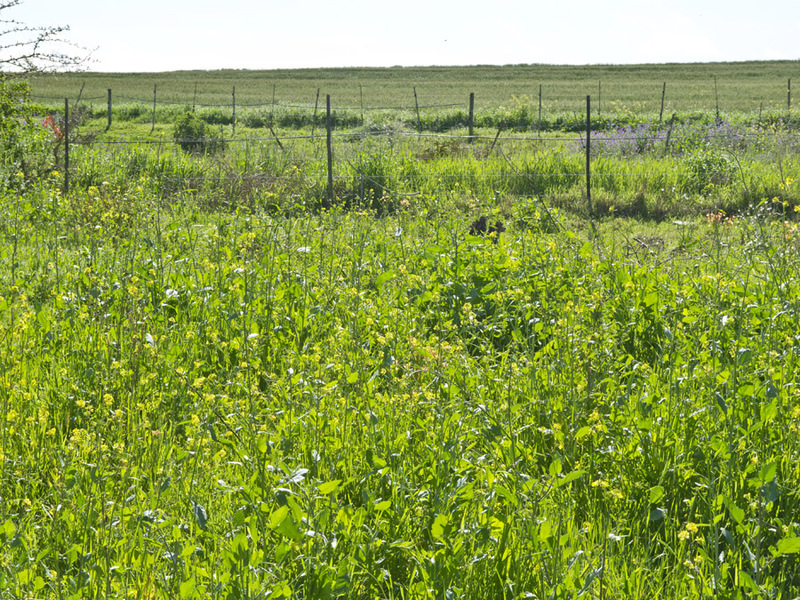 What a beautiful garden, I absolutely adore living on a farm,thats what we call it here in South Africa I’ts always so fresh and open and no cars or ambulance chasing past. And the animals are so cute, we have got dogs, sheep, chickens, ducks and a buck. 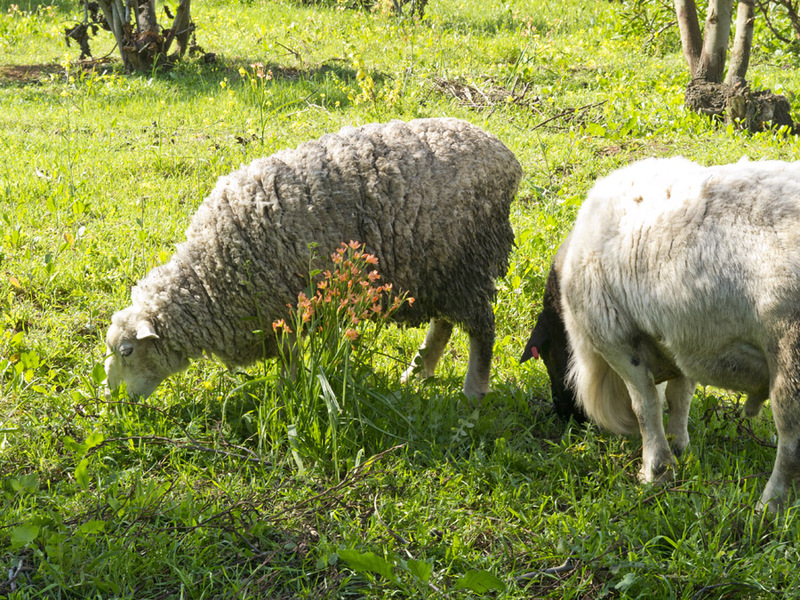 You are doing a real good job with your garden and animals, keep it up !!! Exquisite nests, little works of art and a joyous little yellow bird – how lovely to be greeted each morning by its golden feathers. I think the African Daisy is what we call Cape Weed and the yellow flower looks like Oxalis – both weeds in my garden but very pretty. 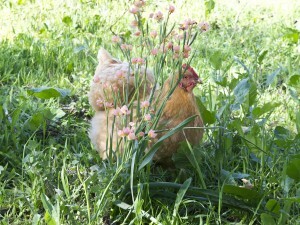 Thanks Kirsty, I love these weeds – it makes for a happy meadow! You have the bevy of critters today, Barbara. 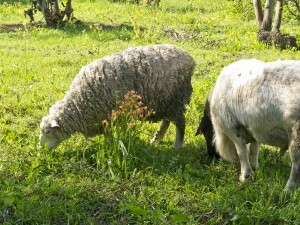 I love seeing sheep grazing, but don’t have that around here for some reason. I remember it in PA though. Same with Weaver, there are none that I know of around here. 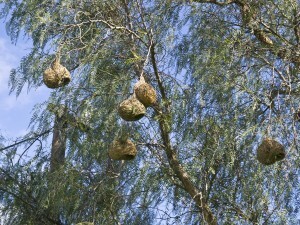 Interesting images of the nests all hanging in the same tree. A little neighborhood! 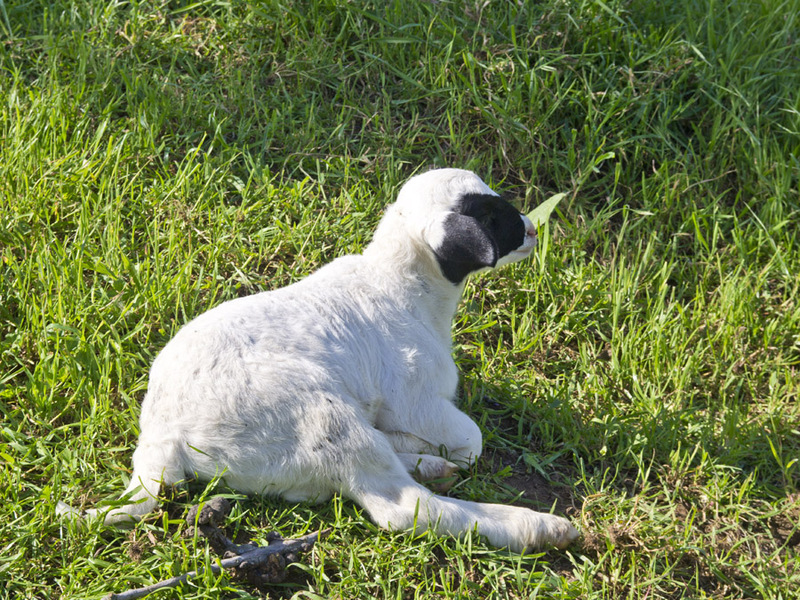 Hi Donna – I am so close to this and it has always been a dream of mine to have this all around. Very grateful for nature’s wonders! How smart of that bird to get free food! No wonder he keeps an eye out! 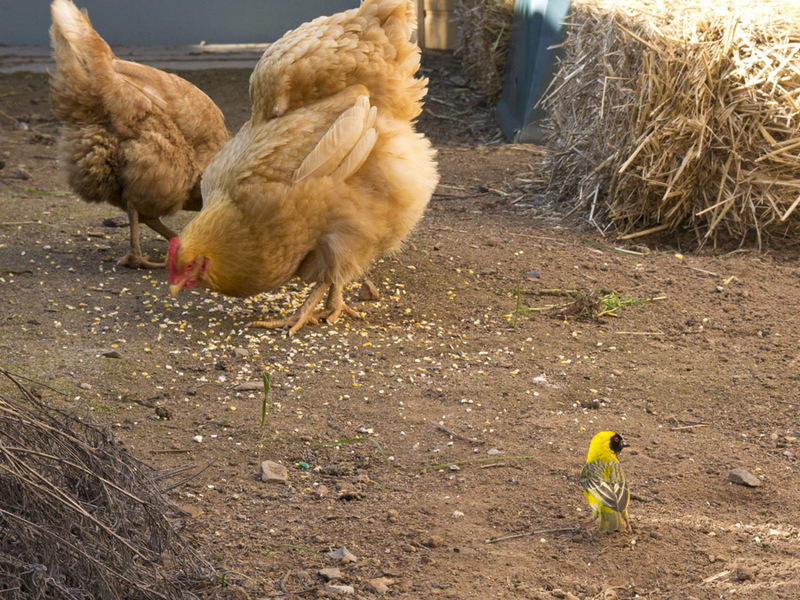 I bet you look adorable “walking” the chickens for their get-together time with the sheep! Sounds like a children’s movie. 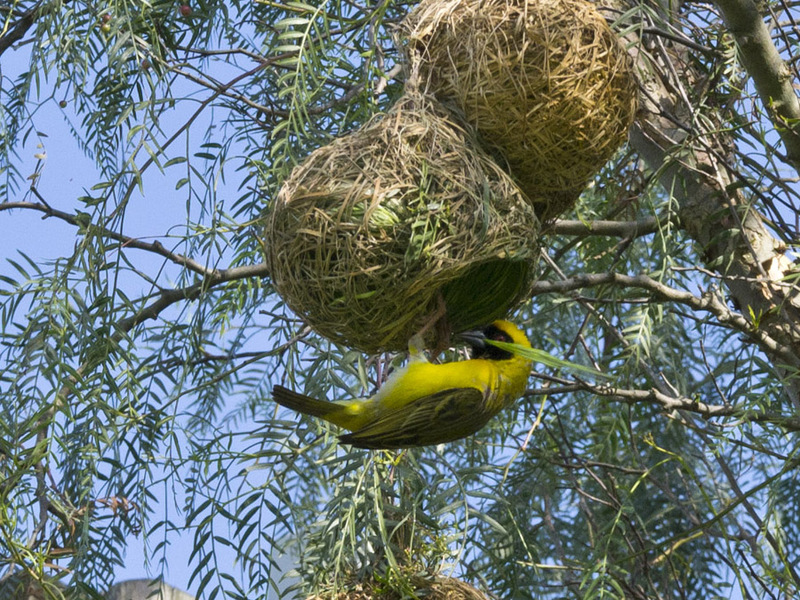 Those yellow weaver birds have a most interesting nest. Great photos! Thank you so much! They work so hard and most times they build more than one. The female throws it down if it’s not to her standard! Poor guy!